This model was started in 1998 and completed in the year 2000. 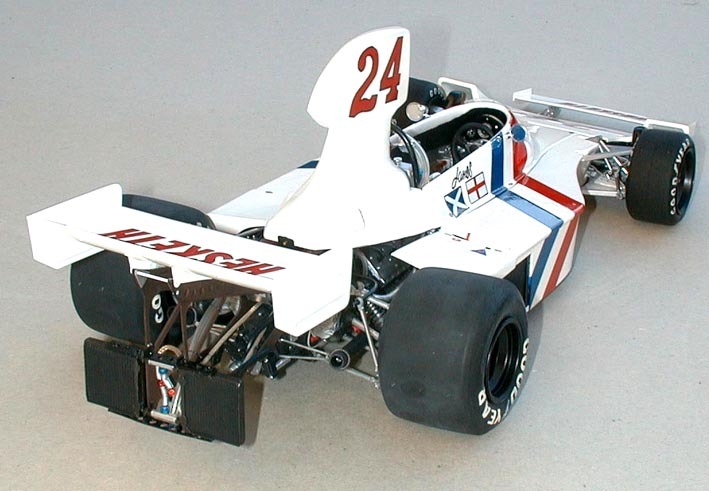 The Hesketh 308 was quite a good car and had potential especially with a young, enthusiastic driver, determined to make a name for himself in an unconventional team environment. There were the workers, driver James Hunt, designer Harvey Postelthwaite, engineer Anthony ‘Bubbles’ Horsley and mechanics. Then there were those at play who gave the team its informal, not so serious appearance, however committed party-goers nonetheless. This group to whom the team owed its ambience, was led by owner Lord Alexander Hesketh and his entourage, who would turn-up at the Grand Prix in coat-tails, top hats and Champagne. 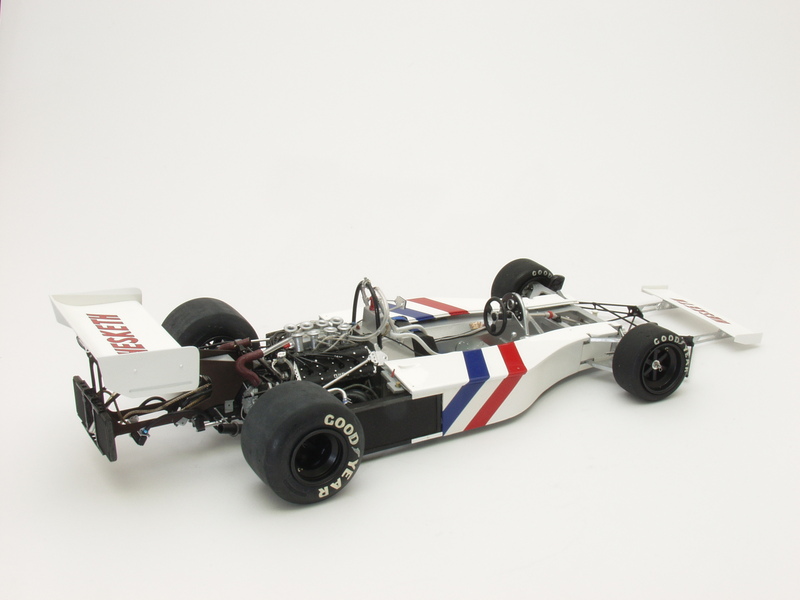 Having said that, since its birth as a team in 1973, the approach and the results showed there was in fact excellent attitude, work-ethic, commitment and ambition, starting with a March 731 chassis. 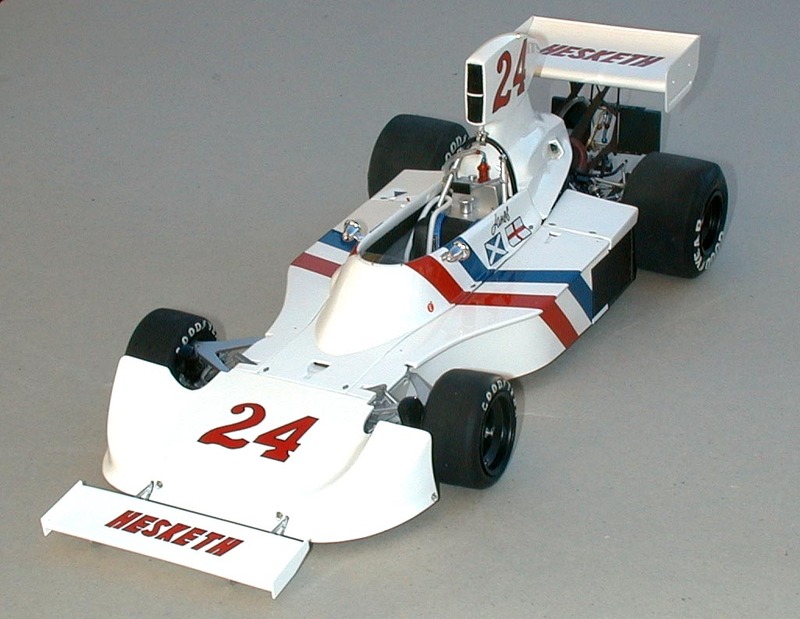 The first Hesketh 308 emerged from the stable block at Easton Neston, Lord Alexander’s stately home in 1974 to score 15 points for sixth place in the Constructors’ title. For 1975, revisions in the 308 enabled the team to score sufficient points for fourth in the Constructors’ title including their famous maiden win in Holland, at Zandvoort. Here, James made a canny tyres choice early in the race to lead on slicks and thereafter held off champion-elect, Niki Lauda. 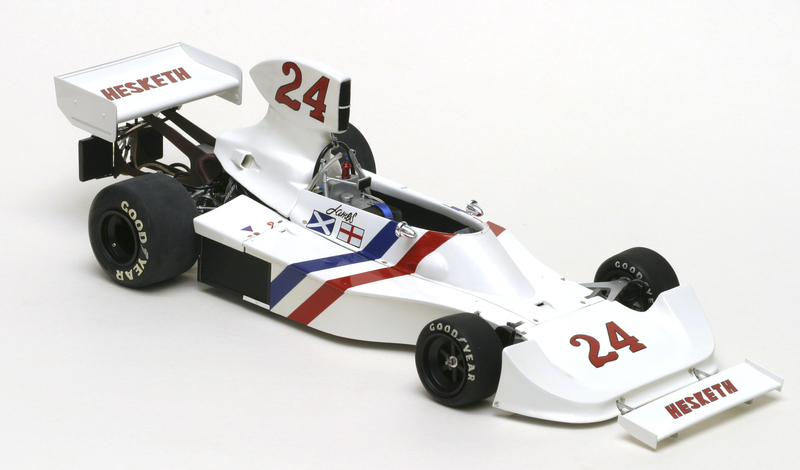 At the end of 1975, the obviously patriotic Le Patron, whose only livery for the car was red, white and blue, failed to turn-up at meetings arranged with would-be sponsors for the coming year. As a result, no deals were done, money was not forthcoming and so with the money set-aside for racing now gone, Lord Hesketh pulled-out and sold-up. 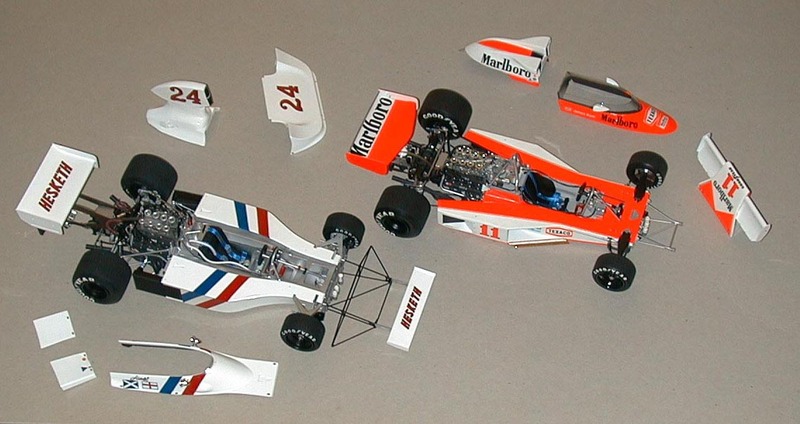 James was left without a seat for next year, but then Fittipaldi declined to re-sign his McLaren contract for 1976 and the rest is history as they say. In order to appreciate in some detail how this model came to be, you are welcome to View the PDF (words only) and even better, if you were able to obtain a back copy of the Scale Auto Modeller magazine, then the full presentation can be enjoyed (all nine pages) with its accompanying photographs. In those earlier days, the editor of the time was more able to accept a longer article, giving the subject full justice, considering the amount of work involved. Essentially however, I began with the desire to produce such a wonderful car as seen in 1/43 scale by John Shinton at a model show in Pershore the year before. I purchased one of these as inspiration and corresponded with John who was able to send me a handful of photos of the real car and a photocopy of a Roger Taylor drawing of the car from the standard views and some sectional information, however there was no internal detail data. Naturally, I had no hope of access to the real car and therefore the thought never occurred to me, for I was still in conversion mode, from a box-kit to an alternative model, relying only, on visual assessment. Because this was more than a conversion, I needed more information and more help, so I contacted Harvey Postlethwaite who designed the car and he was generous in supplying thoughts and a few line drawings to get me on my way. At about that time, I was trying to find out about James Hunt’s 1976 McLaren M23 and had been invited to attend the informal annual examination of M23/9 which resided in the Midland Motor Museum in Stourbridge where the owner (Leo W) would check the car over, clean and polish the bodywork, give the DFV a run-through and check out the gears and compressed air-starter mechanism etc. Whilst at this privileged gathering in the museum car park on a gloriously sunny Saturday morning, magical in every way, I happened across Dale P, one of Jim Clark’s mechanics who had come to help Leo. Chatting to Dale, I asked what he was up to these days, “working on the 308” he replied. “So am I!” I replied in astonishment, “in fact I have it here in my car today”. We looked over my monocoque interpretation which lacked certain internal detail (as per limited drawings I was working from) and Dale was quickly able to put me right. He invited me to see the real 308 currently being restored in Luton. Within a few weeks, I visited the restoration project and put right, all that was amiss on the model as well as obtaining invaluable additional detail photographic detail I couldn’t otherwise have hoped to find out about. My main aim was to get the nuances of the appearance of this iconic car ‘just right’ or as near to this ideal, as possible. In the end analysis, the former owner of the car certainly left me in no doubt that he could fully identify with the model. This being my first contact with the real car relating to a current project, I was on a steep and very enjoyable learning curve and looking back now on the data acquired, nowadays more visits (where possible) and more drawings and measurements would be obtained, plus more photos. However, there was ample material to enable me to greatly improve the model and bring it to final fruition as seen above. 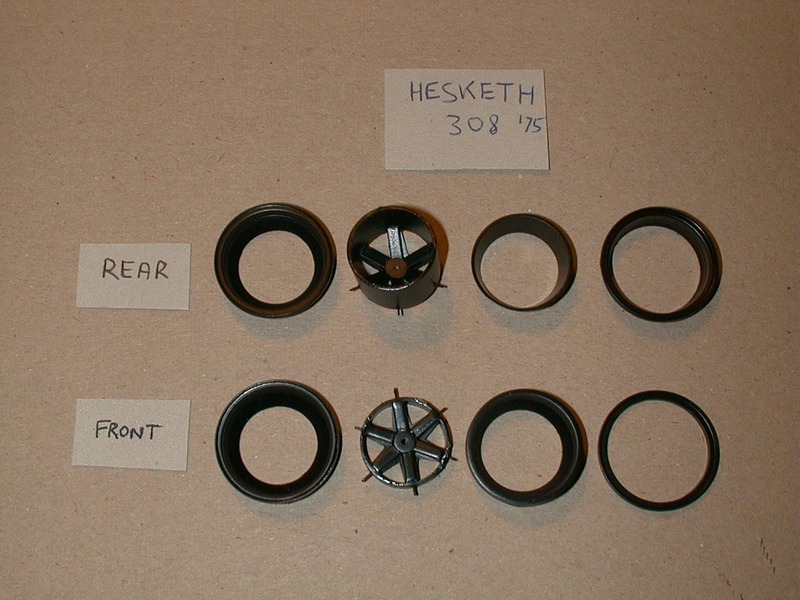 Of course in retrospect there are improvements in dimensions, in details and in the fineness of the parts that I would incorporate if I were to repeat the exercise. The car available to me at the time had a repositioned roll-over bar due to a serious shunt and the replacement would have to be removed with serious engineering changes to the rear of the monocoque to enable the period 1975 roll over bar to be replicated. This I believe has now been done, but I would have to check chassis numbers to ensure it was the same car. 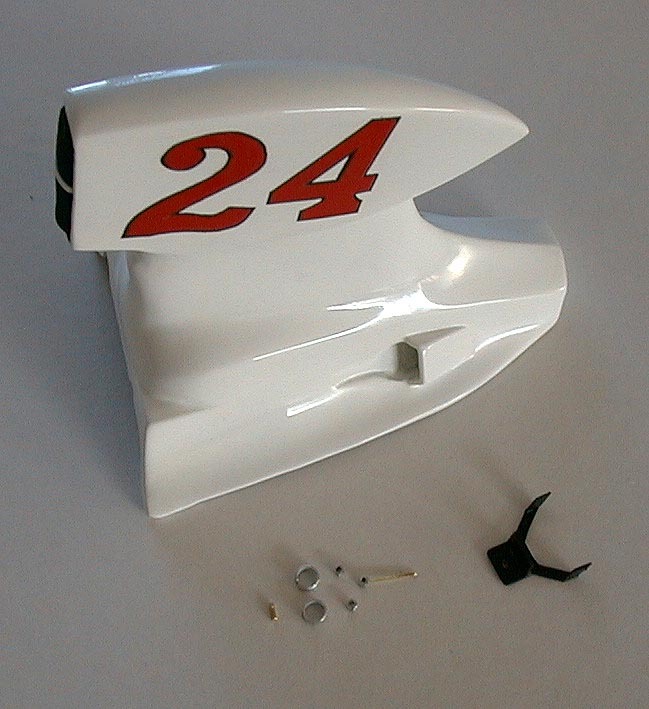 After the model was built, there were tales to tell of a telephone call from Dale on the evening before the shakedown test at Silverstone, the consequent correspondence with Lord Hesketh and later a visit with the model to Towcester, Northamptionshire etc; but that’s another story! During 2014 I worked on the production of my third Photobook, namely ‘Volume 1, Hesketh 308, (1975)’ which followed the first two (‘MRO F1 Engineering – the first twenty years’ and the second one, ‘Volume 4 McLaren M19C, 1972’). This most recent photobook relating to the Hesketh 308 was released on Aug 2nd, 2014. The first book generously covers the whole of my modelling experience interacting with the real Formula One world and encompasses 70 pages of abundant photos and text. 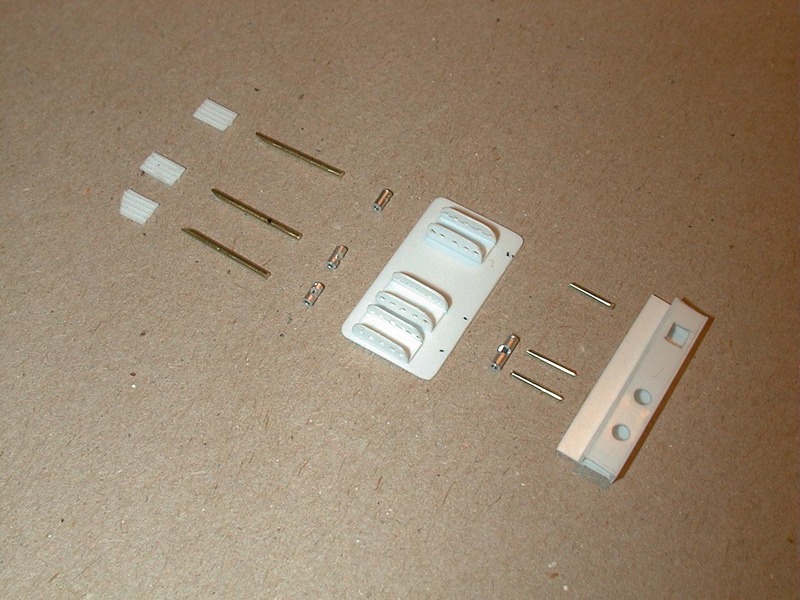 This slightly larger (68 pages) Hesketh volume is similar in presentation to the second 60 page book which describes in detail the production of the 1/12 scale McLaren M19C model. 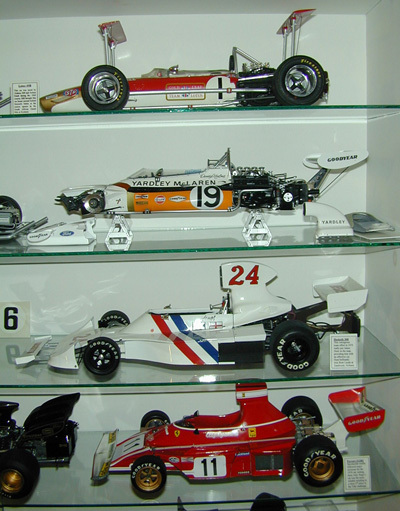 Pictures of the Hesketh model during production are interweaved with photographs of the real car during restoration and also the car as it was in the mid 1970’s. These books are described via the interactive banner and posts on the home page and also via Twitter each providing links to the electronic version on Photobox. Copies can also be purchased through myself for £70 excl Postage and Packing.